The non-essentials are those things that do not fall into one of the categories above and get cut out during a no spend month. It means skipping the lattes, eating out, new clothes or shoes, and impulse buys. Honestly, I went into our no spend month thinking it wouldn’t be much different from any other month. Then I quickly realized that sticking to a monthly budget is not the same as efforts to cut out non-essentials built into the budget! It really takes self-discipline to skip routine things like the occasional lunch out with co-workers or an afternoon snack from the vending machine. No matter what month you choose to do a no spend month, these tips are meant to help you in achieving your goals. 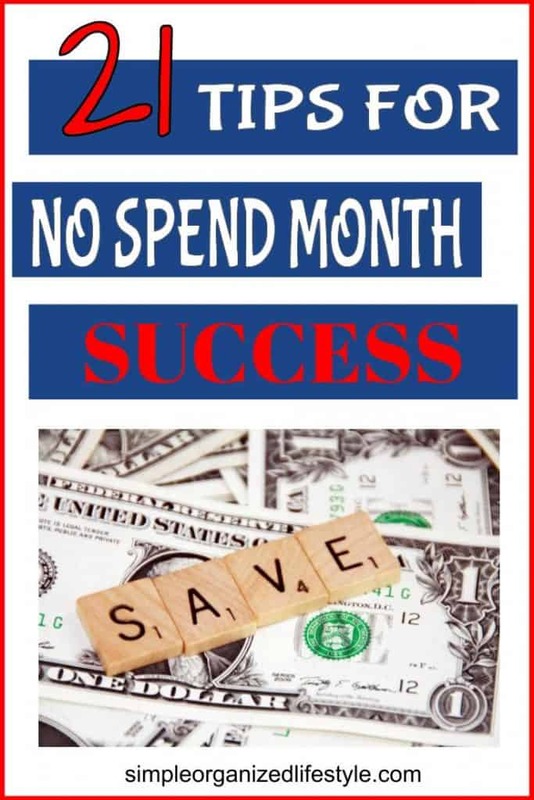 A no spend month is like a diet for your budget! It’s not easy, but the results are worth it! 1. Use up foods in your pantry and freezer. “Shop” and plan your meals during the no spend month from what you have on hand. While groceries are on the necessity side, chances are you can cut the normal grocery budget in half by using up what you already have. You could also plan more frugal meals, such as breakfast for supper. My friend Julie from Dogwoods & Dandelions has a great list of frugal meals for a week for less than $75 to help give you some ideas! During the no spend month, plan to eat at home as much as possible. Restaurants are full of temptations and ads to convince us we need to super size our meals, or add an item for just $1.00 more. The best way to combat that temptation is to avoid eating out during this month. 3. Make coffee at home. Skip the gourmet coffee or lattes during the no spend month and make your coffee at home. It’s amazing how much just a few lattes adds up over time! There’s actually a whole study about it called “The Latte Factor” from personal finance author David Bach. His book is great and really makes you think about how much small purchases add up over time. 4. Use any gift cards for something you want. 5. Plan your meals in advance. No spend months require planning your meals in advance. Make a list of your pantry and freezer inventory and use that list as a starting place to plan your meals for the month. Since food is a necessity, the goal will be to use what you have (tip #1) and keep the grocery items to a minimum. This requires some planning in advance. 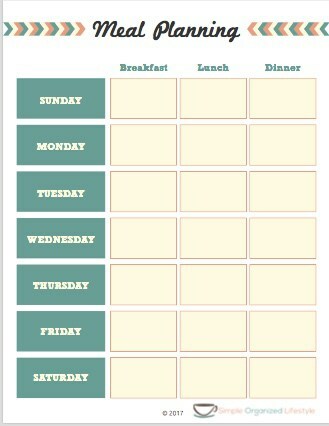 I have an editable meal planning template in the resource library. It looks just like the template below and you can type directly in the boxes. It’s located in the “Organize” folder once you’re in my shared Google Drive folders. Everything in the resource library is free and easy to save to your files. 6. Watch movies at home. Movies at home are a great option for free entertainment. This is a time to pull out some favorites or find some movies you haven’t seen yet on Netflix or Sling TV (considered a monthly bill for those who have opted for these streaming services over cable). This can be a fun activity for the whole family! 7. Spend time decluttering, organizing, reading, or learning a new skill. A no spend month typically means more time at home and away from stores. Spend that time at home on things you’ve been meaning to do such as decluttering, organizing, reading, and/or learning a new skill. In fact, this is a great time to have a yard sale and not only save money, but earn more too! 8. Borrow an item you need from family or friends. If you come across an item you just really must have, check with friends or family first to see if it’s something you can borrow temporarily. This is great to do anytime of the year to save more money. This past summer, we signed up for ice cream at a family gathering. We thought homemade ice cream would be a treat for everyone, but didn’t have an ice cream maker. We simply borrowed one from a family member and it worked out great. A few days later, we returned a clean ice cream maker along with some ice cream and everyone was happy! There are many community Facebook groups and sites like freecycle.org where you can both give items away and look for items you may need. It’s a modern day way swap shop! 10. Make a list of things you want. This strategy is very effective during a no spend month. It works by making a list of things you want and seeing if you still want them next month. You will most likely find out you didn’t really need those things as much as you thought. If you spend cash too quickly, then don’t carry cash during the no spend month. The alternative to this is only carrying enough cash for anything on your essential list and making sure it’s used for that purpose. 12. Take lunch to work. Make and take lunch to work during the no spend month. This is a great time to “brown bag it” and either take leftovers since you’re eating at home during this time, or pack a simple sandwich and some fruits or veggies. As much as possible, keep your shopping to those places where you need the essentials- mainly the grocery store. I wrote an entire post about how to avoid department stores as much as possible. Their job is to design and market to consumers in every way from the entrance (think dollar section at Target) to the exit (notice motion LED lights on the gum). Skip the stores as much as you can during the no spend month and pay yourself instead! 14. Keep snacks and water at work. My desk at work is literally just a few steps away from a vending machine. I have bought soft drinks when I wasn’t even really thinking about it until I heard the someone opening a tab! The best way I’ve found to be healthier and resist the soda pop pressure is to keep water and snacks within reach at work. 15. Have meatless days worked into the meal plan. During a no spend month, you may want to have more than a “Meatless Monday” worked into the meal plan. Add more hearty soups and beans to the menu during this time and you probably won’t even notice when these meatless meals are spread out throughout the month. 16. Turn it into a challenge with the whole family. Before the no spend month starts, talk about it as a family. Even young kids can understand the concept of saving more money. I think this is a great opportunity for teachable moments and a challenge for the whole family when it comes to personal finance. 17. Find free activities to do with the kids and family. Get creative during the no spend month and find free activities to do with the kids and family. Have a family movie or game night. Check out the community calendar to see if there are any free local events in your area. Some of these free activities will become experiences that your family will remember for years to come. 18. Get an accountability partner. Tell someone who you know will be supportive about your no spend month for an accountability partner. Keep this person updated with your progress and share anything you’ve learned along the way. This person will may very well decide to join you the next time! A simple solution of vinegar and water can clean just about anything. You can add baking soda or dish soap when a stronger scrub is needed. These are items you probably already have on hand and they another bonus is avoiding strong chemicals of store bought cleaners. 20. Use up trial size items on hand. The other place to “shop” during a no spend month is in your bathroom cabinets. Look for trial size items you have on hand to use up. These usually accumulate in luggage from past trips and end up being thrown away as they expire. A no spend month is a great time to use up things you already have and save more money. 21. Spend less time online. Have you ever thought your computer is getting to know you a little more than you would like? That’s ad targeting at its best. Websites track things you search for and use that information to send you an ad for the same item just a short time later. This makes a no spend month more difficult so spending less time online means less temptation of online purchases. Hopefully this gave you some ideas as you plan to have a no spend month. 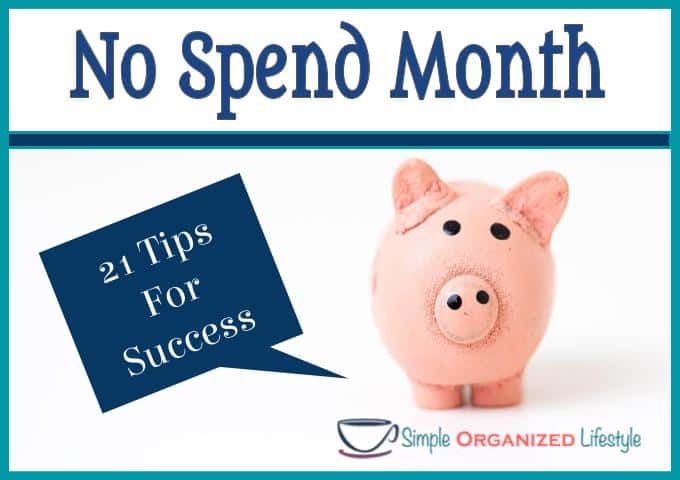 If you have other tips for a no spend month success, please feel free to leave them in the comments! One of your ideas is Dont carry cash – I am absolutely the reverse, if I am trying to keep a handle on my spend, I only use cash, and lock my cards up. Whereas cash, you have to count the notes and coins out. It is limited if not backed up by a card, so if you restrict what you can take out of the ATM – boy do you focus! Absolutely. I have a friend who only carries cash and when it’s gone, it’s gone. For me, it flies out of my hand too fast whereas I’m much slower and better at sticking with the budget with a debit card. It’s great you have found out what works best for you and have that self-discipline! Thanks for sharing your thoughts! This is a great list and a reminder for me to try it once and commit to it! Number 21 is surprising and at the same time so true. Thank you! Our family hasn’t done this in a while. Great reminder! Thanks for all the tips on how to make the month a success.